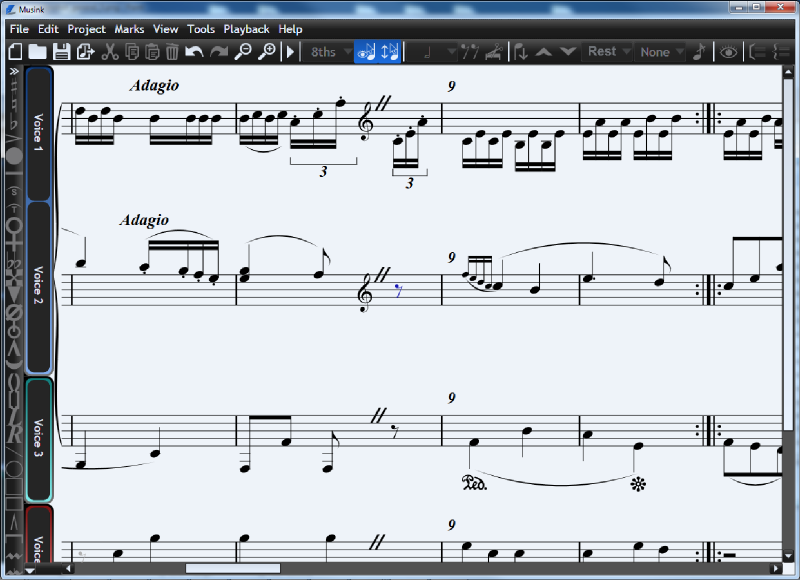 Musink is a free music-composition software package that lets you write music at unprecedented speeds. With Musink, you can create anything from orchestral scores, to short-musical-snippets, to exercise books. Musink is particularly useful if you are a publisher, drummer, or writing music for many voices. Musink is optimised for speed and ease of use. Notes are added by simply putting the mouse where you would like a note, and clicking. Musink automatically takes care of music rules and layout for you. Everything possible is automated, including note duration, page margins, title positioning, bracket-numbering, stem directions, and mark-arrangement. You can even change the entire look of a score in seconds, simply by choosing a different template (page layout). These features are designed to let you focus on what you came to do: write music. Musink can play back your music to you through any GM-compatible MIDI device. It can also export your work as MIDI and lets you export MIDI loops. Musink can publish your score to as a PDF or XPS documents, or as a series of PNG image files. Your score can then be directly dropped into Microsoft Word documents or put onto the web without requiring plugins. Statement: First, please download the orginal installation package by clicking the download link. Of course you may also download it from the publisher's website. Using Musink Lite crack, key, patch, serial number, registration code, keygen is illegal. The download file hosted at publisher website. We do not provide any download link points to Rapidshare, Hotfile, Depositfiles, Mediafire, Filefactory, etc. or obtained from file sharing programs such as Limewire, Kazaa, Imesh, Ares, BearShare, BitTorrent, WinMX etc. Software piracy is theft. If you like Musink Lite please buy it.